The 50th Anniversary 2017 SnoDrift Rally was held this weekend starting out in Lewiston on Friday. The winners of the race were, car number 198, Arkadiusz Gruszka & Lukasz Wronski. WBKB News was on site Friday for all of the kick off action, here’s a recap. What do you get when you mix racecars, with snow and ice? A SnoDrift. The annual SnoDrift Rally started its engines on Friday with over 30 teams racing their way through Montmorency County. Starting out in Lewiston Friday, racers from all over the world competed this weekend for pride and the honor of one trophy. The 15-stage 130 mile long race also made its path through Atlanta and Hillman. Media Coordinator, Alex Berger said the event brings in many tourists to Northern Michigan. “What makes it special is that we’re the only winter event in the Round American Series. So people come from all over the country and different places around the world to race in this event because it’s’ a chance to race in the snow, we don’t see a lot of that in the American Series. So that brings a lot of people, and people like to come and watch the cars slide around. So we bring in people from everywhere to watch the event,” Berger explained. Racing in SnoDrift since 2011, Tingwu Song traveled all the way from China just to experience the Michigan roads once again. “America there is quite of a lot of racing events, in China as well. We hear about them because the big (famous racers) people like David Higgins, and Ken Block they would come here and race here. Many people like myself want to come here and experience the same roads and conditions that the other big (famous racers) people are fighting through,” Song said. 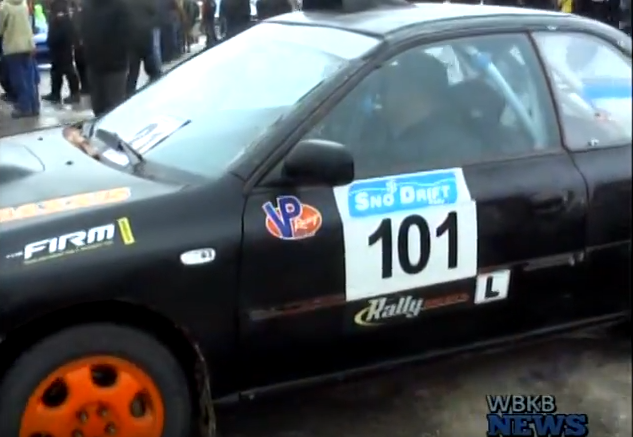 To get through the challenging paths of snow, ice, mud and water a racer must have a co-driver, and that’s just want Ireland native Martin Brady is. “I think experience is the first thing. You got to start somewhere but the more experience you have like any sport, or any task the more experience you have the better you get. Obviously you can’t get car sick, you have to be able not to get lost, and you got to read and write and that’s about it, you got to like speed,” Brady said. The 2017 SnoDrift ended at Hillman Community Center. In Lewiston for WBKB News, I’m Star Connor.